Pet friendly accommodation in Whitby can be hard to find, which is a shame as Whitby is a very pet friendly town, with many pubs and restaurants allowing admission to our furry friends. Whilst dogs are restricted from the 1st May to the 30th September on the West Cliff beach, dogs are welcome on Tate Hill Beach all year round (see pic below - Tate Hill beach marked). 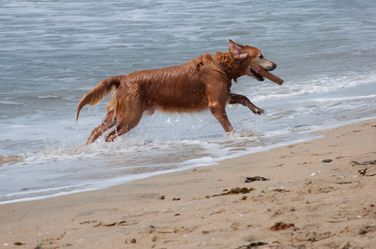 Please note that from 1st May to 1st October, your pet must be kept on it's lead when using Tate Hill beach, whilst during the Winter months, it's fine to let them run free. There are many other places in and around Whitby to make sure that everyone's legs get thoroughly stretched. You might choose to walk a segment of the Cleveland Way, this path stretches for over 100 miles from Helmsley, on the southern edge of the North York Moors National Park, to Filey on the east coast. Alternatively, there is the former rail line running from Whitby to Scarborough, now converted into a delightful Cinder Path for cycles and pedestrians with many interesting sights on the way. Feel free to bring your clean well behaved pets to our pet friendly accommodation in Whitby here at Harbourside Holiday Cottages, there's just the small set fee of £20 to pay and that's all, regardless of how many nights you're having or how many pets you bring.